Balloons are as synonyms with parties as streamers and cake, but helium supplies are diminishing. Now may be time to consider some alternatives to bouquets of floating balloons for party décor. 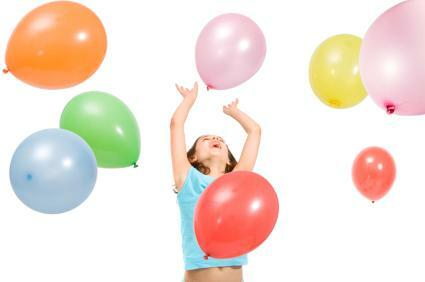 Helium is a natural, non-renewable resource derived from natural gas. In 1925, the United States understood the importance and versatility of the gas and stockpiled it, according to MD+DI, the Medical Device and Diagnostic Industry website. Helium is a necessary element in some military operations and many medical procedures. Magnetic resonance imaging (MRI), for instance, rely on helium to operate, as noted by the U.S. Bureau of Land Management. The gas is the only known natural element that can keep the magnets in the MRI machines at a cool enough temperature to successfully operate. As helium becomes more scarce, the price for the gas will increase and may become impractical for casual use such as filling balloons. During a helium shortage, it will become increasing expensive and may not be practical to use it as a party decoration. It may also be hard to find places that still fill helium balloons. Party planners should look for other ways to create festive and colorful décor without the use of helium balloons. Don't discount the use of simple air filled balloons. 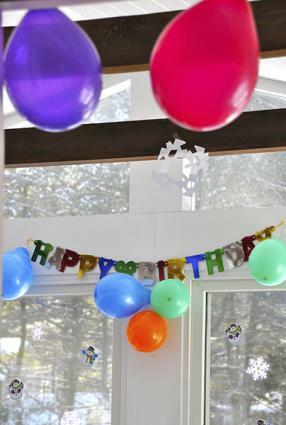 Add height to the décor by taping the balloons to walls or windows or attach the knot of the balloon to a stick. Attach several balloons to sticks and place them into a vase to create a bouquet for tables. Another way to use air filled balloons is to place a marble inside the balloon prior to blowing it up. Then hang them upside from the party venue ceiling. Large tissue paper flowers can help to add color and beauty to many different types of parties and can be used in a variety of themes. Making your own tissue paper flowers is an easy and cheap alternative to buying other decorations. Use colorful tissue or even tissue with polka dots or strips to add some texture to the blooms. Put a grouping of flowers into a vase for table décor, leave the stems off and tape them to a wall, or string them together to create a garland. 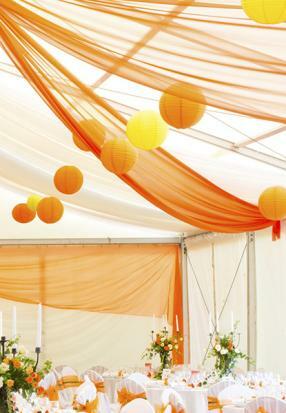 Hang colored paper lanterns from ceilings as a practical and attractive alternative to helium balloons. These lanterns can be purchased in a variety of colors from craft and hobby stores or you can make your own paper lantern. Decorate the lanterns with flowers and ribbons. You can also allow guests to decorate them with stickers and markers. One of the main appeals of helium filled balloons is how beautiful they look when floating in the air. Achieve this same effect by hanging long lengths of ribbons or streamers onto sticks and putting them into the ground or simply hanging them from trees and allowing the wind to blow them. If you are having an indoor party, consider hanging these outside to create a festive look for when guests arrive, or hang them inside by an open window. If you are having an outdoor party, consider using spinners, both large and small. 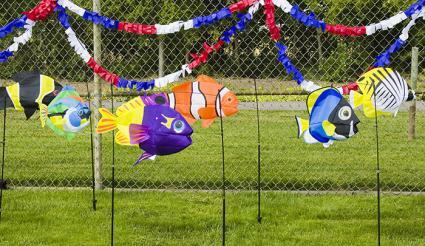 The sticks can be pushed into grass or stuck into a bucket of sand to create a sense of motion and add color to a party area. You may also want to buy or make a couple of kites to fly and then secure their strings to a post or a stake in the ground. Windsocks are also good at adding color and movement to a party venue. Hang them from decks or tree branches, or attach them to a stick that can be stuck in the ground. Banners are a great way to add color and display a message. 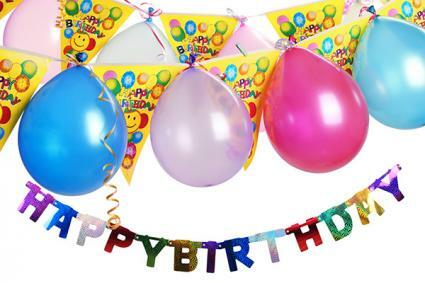 Store bought banners come with a variety of messages such as "Happy Birthday" or "Congratulations." They are also available in a variety of colors and themes. Contact a local printing company about having a custom banner printed or simply print out each letter of your custom message on a separate piece of paper from your own printer and string or tape them to the walls of the party venue. Create a garland out of a variety of different items to help decorate a party room. Garlands can be created by stringing items together. Consider using candy to create a garland for a Candyland themed party or simply string silk flowers or shapes cut from paper for a colorful and theme-specific look. You might also consider creating some origami cranes and stringing them for a unique garland. If you are going to have a party and want to create a festive look without helium, be sure to plan ahead. While it is quick and easy to order a helium balloon bouquet, the alternatives may require more planning time. Be sure to allow yourself enough time to purchase or make the items you decide to use in place of the helium balloons.